As I alluded to in my previous post, I spent my Black Friday visiting fabric stores. 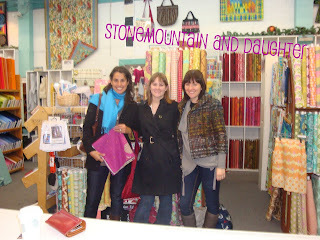 I met up with my sewing girlfriends Cindy (who visited me a couple of months ago) and Leslie for a day of fun. Next stop, Stonemountain and Daughter in Berkeley. Both photos the cutter took for us were slightly blurry, her arm must have still been quivering from cutting all of our fabric. I think we were there for 2 hours. We were armed with Black Friday coupons for 20% off regular priced fabrics, plus there was great stuff in the 50% off sale section upstairs. 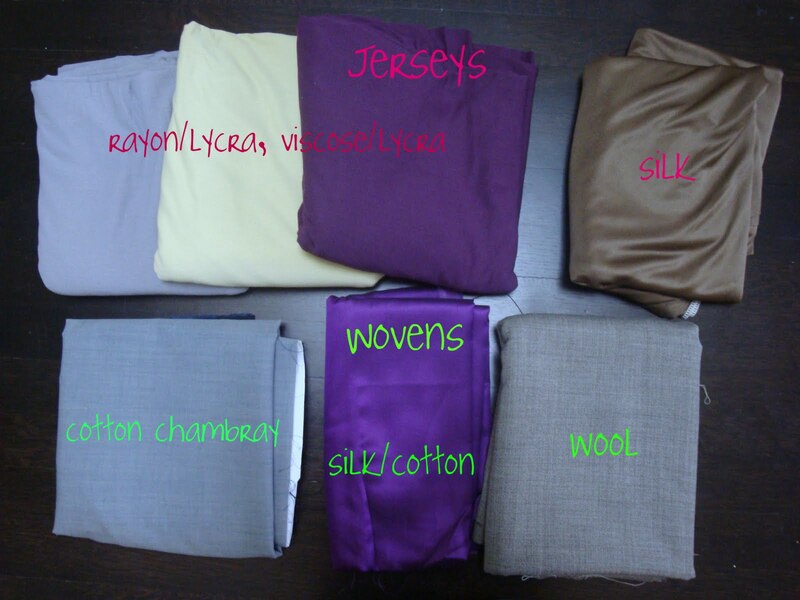 As you can see, I stuck to basic solids that should stand the test of time (if not in the closet then in the stash). Only the cotton chambray is from Britex, the rest is from Stonemountain. Purple is one of my favorite colors, but I have hardly any purple clothes, so I made it a point to include some in my shopping cart. The silk/cotton woven is the same type of fabric I used to make BWOF 6-2008-120 (this is even the same color) and BWOF 7-2009-104 . It is truly the most divine fabric to work with. 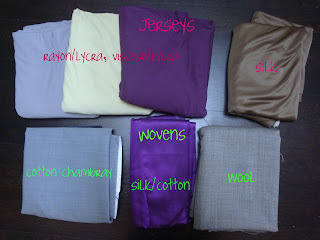 Stonemountain had an amazing selection of silk jerseys, a few solids and close to 20 different prints, all priced at $20/yard ($16/yard with coupon!). I was very tempted by several of the prints - you know how you carry a bolt around the store with you while you "think about it". Ultimately I stuck with a solid, neutral olive color. At 60" wide, it was a steal. I was also thrilled to find the "Home Sewing is Easy" print by Alexander Henry. It's based on a vintage sewing booklet (a copy of which I'm lucky to own), and I didn't even know the reproduction fabric existed until Sew Tessuti shared it with us. My plan is to use it as a ironing board cover. But now I'm thinking I first want to upgrade from my 14.5" wide ironing board to something wider (18"+). Any suggestions? One more thing - in my previous post, I mentioned that I had found one of the Threads DVDs, Threads Industry Insider Techniques, at my public library. It is well worth watching, I highly recommend it. I can't wait to try out the pattern alteration to create a bulk-free collar. Also, Louise Cutting demonstrates the proper way to use a point turner, which was a real eye-opener for me! I always assumed you were supposed to just shove that little thing in the corner of your newly-turned-out collars (as is shown on the package in the link); Cutting's method is much more sophisticated and less likely to poke straight through and damage your fabric. Nothing interesting at Britex? They must be falling down. Looks like a very fun time you ladies had! For an ironing board, check Walmart. I wanted a wide on a few years ago, but couldn't stomach the nearly $100 price tag at Bed Bath & Beyond. They had nearly the same ironing board at Walmart for about $40 (it might have actually been less). The cover that came with it was crap, but since you're making a special one, that doesn't really matter. What a great day!! I didn't see that silk/cotton you got, it's gorgeous! I may have to go back. Because I already had an ironing board for a sleeve, and a mini tabletop ironing board for small items (I sew a lot of children's clothing), I decided I didn't need one more ironing board. What I did instead was purchase 2 yards of discount quilted fabric, and 2 yards of heat-resistant ironing board fabric (to make your own cover). Because I have a long L-shaped counter in my kitchen, I simply lay the quilted and ironing board fabric right on my counter and voila! I have a huge ironing board. And storage is too easy! What a great day! Fabric, friends and more fabric! I have to admit that every time I see pictures of Britex I flash back to my one and only time there. You got some great things and I'm so glad you had a good time with sewing friends! What lovely fabrics! A bargain on that silk jersey. If you have room for an ironing table top I'd go with that. I've had one for a year or more and I don't know how I got along without it before. I use all my tailoring aids without them falling on the floor all the time. I use a sleeve board for getting into tight areas and a long wooden seam roll for pants seams. I almost never use my ironing board anymore. OK, now I'm dying to know. What was Louise Cutting's tip for using the point turner? I just bought one. For years I used whatever handy tool was laying around to pull the point out (rather than push the point out). I have a yard of that print too! I love retro stuff! I got mine from fabric.com a few months ago. 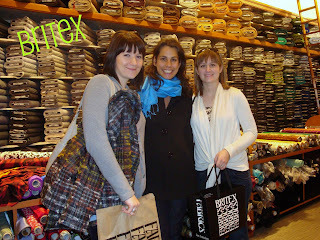 Wow, I was just at Britex 2 weeks ago (traveled all the way from Chicago!) and bought a striped Burberry lining on the remnant floor, but missed the plaid wool Burberry remnant! There was a gorgeous red paisley Italian viscose there too, but it cost too much even for a remnant. But I petted it for awhile. I just got this ironing board as a wedding gift (woo-hoo), and I luvvvvvv it: http://www.bedbathandbeyond.com/regProduct.asp?order_num=-1&WRN=-347787349&sku=16842303. Of course, it is pricey, but you could always use a coupon. I've heard that Walmart has similar less expensive ones - but I don't live near a Walmart so I've never seen them in person. Almost as good as a trip to NYC's garment district! I'm glad to hear you found the Threads DVD worthwhile; I'm always curious about those. 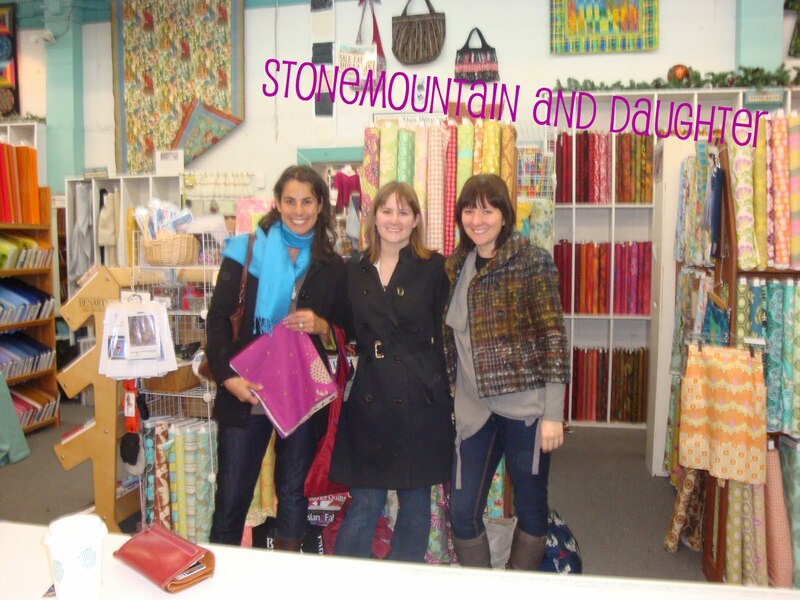 That looks like a fabulous trip and a great collection of new fabrics. I didn't realize the Seattle library had that video in its collection. I'm putting it on hold--woo hoo! What a fun time! I am so jealous! awesome! i love how coordinate ur color choice of fabrics. i really wish we have black friday here at my place too. Ooooooooooo - you are so, so lucky to have a trip to Britex. It is so much fun and so productive. Love your pictures - so I can live vicariously through you!